Arms’ first big update added a few much-requested features to the slinky-limb fighting game—and took away some unpopular ones. Most of those features improve upon Arms’ strong Ranked Mode, the game’s bread and butter. 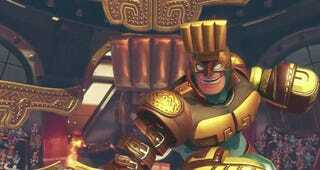 Max Brass, Arms’ single-player final boss, is now a playable fighter. He’s the “reigning champion” of Arms’ Grand Prix, a tournament in the game’s story, and mentors up-and-coming talent. As a fighter, he plays a lot like Spring Man and can deflect opponents’ arms. But because he’s way hulkier, he’s also easy to hit. He’s well-rounded, quicker than he looks, and super fun, especially with his three new arms—the Nade, Roaster and Kablammer. I love the Nade, a “high-risk, high-reward explosive” glove that explodes on impact. Like the Roaster, it’s super hard to aim, though. Players wondered whether, at the end of Arms’ single-player mode, Brass would encounter a boss other than himself. Several were disappointed that, actually, it’s still Max Brass. Either the Brass vs. Brass narrative is some trippy psychological horror, or, players say, it’s lazy. Arms’ update also shows that Nintendo is listening to more competitive-minded fans who want Ranked Mode to be as smooth and fair as possible. The highest rank you can get is now 20, an increase from 15. Also, the stage Sky Arena, Max Brass’, is a flat, static environment that lets you devote your attention to slinky fisticuffs. Much in the vein of Super Smash Bros., too many distractions from pure gameplay can be frustrating for fighting game aficionados. So, Sky Arena’s very opposite stage, Snake Park, which is loaded with floating hoverboards that are hard to battle on, was removed from Ranked Mode. Also exciting for Ranked fans are Arms’ new penalties for players who disconnect during Ranked games. Ranked seems plagued by rage-quitters, so this addition was desperately necessary. Those penalties are not detailed in Arms’ update, unfortunately, but if you’re a salty Arms player, time to step up your game. A fun, more playful mode was also added. Hedlok Scramble has two players fighting for the parasitic playable helmet that functions as Arms’ single-player’s final-final boss after Brass. Hedlok adds two new pairs of arms to a character, which stretch out of their head. Opponents try to steal the wearable Hedlok from the center of the stage, and whoever has it has the advantage. Players can steal the Hedlok by throwing or landing powerful attacks on their opponent. It’s a fast, fun and high-energy hot potato mode that I’m really enjoying. With these changes, Nintendo is refining Arms’ Ranked mode and adjusting its fighters in support of that, capitalizing on the game’s one major strength. Although Arms is a bit of a one trick pony, hopefully, that one trick will eventually feel clean enough to merit Arms’ laser focus on 1 vs. 1 slinky boxing.